Butternut Squash Cheeseball and a Holiday Cheese Board! How I love you and your 90s vibes. 80s vibes? 70s vibes?! I don’t even know. I bet you’ll tell me. We make the classic olive + cream cheese cheeseball for every holiday in our family and it tastes like HOME. So naturally, I decided that I had to switch things up and put a little spin on the classic. My mom is really wondering right now why I just can’t let things BE. I mean, why can’t I? It’s a sickness. My butternut cheeseball is full of the quintessential butternut fall flavors: brown butter, crispy sage and tons of parmesan. It might be the only cheeseball that I want to eat with a spoon and only a spoon. EVER. It also should come as no surprise since the moment October (errr… September even) rolls around, butternut, brown butter, parmesan and sage starts coursing through my veins. So! What kind of appetizers are you serving on Thursday? To be real, I’m allllll about the main meal, so I don’t go overboard on the snacks. Wait. 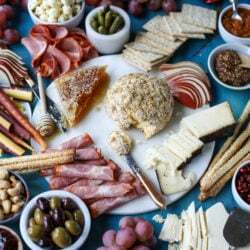 What I mean to say is that I don’t go overboard making multiple appetizers and instead go overboard on one large appetizer: the cheese plate. I could eat this entire thing for dinner and not be mad about it. In fact, I have eaten this for dinner. I hope this serves as some cheesy inspiration for your big meal. The cheeseball is fantastic in itself and doesn’t necessarily need all these snacks around it to shine. You could do the cheeseball and a few crackers and be good to go. BUT. If you’re ever so inclined to drive your party hosting bus over the cheese board cliff and go a little nuts, I’m here for you! And I’m hungry. Place the squash cubes in a saucepan and fill it with cold water. Heat over high heat until it comes to a boil, then reduce it to a simmer. Simmer for 15 to 20 minutes, until the cubes are fork tender. Drain them well, removing all water. Heat the olive in a saucepan over medium heat. Add the fresh sage and cook about 1 minute per side, just until crisp. Remove it and place on a paper towel. After 30 minutes, place the chopped walnuts on a plate. Remove the cheeseball from the fridge and set it on the chopped walnuts. Coat the ball in the walnuts, pressing gently to adhere. At this point, you can serve the cheeseball immediately or set it back in the fridge until you’re ready to use! Throw it all on your board! The beauty is in the messiness. 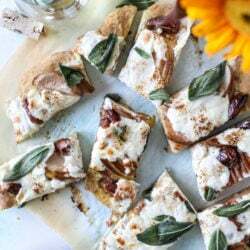 Savory Pear, Date and Burrata Flatbread with Crispy Sage. I love the sound of this!! I NEED it in my life!! yum! This cheeseboard is so impressive! I know my guests would enjoy this for Thanksgiving! Wow… I wish we had that for my thanksgiving. The honeycomb looks so delicious. I must try that one day! Looks like a delicious cheese platter! That cheeseball is such a fun idea! We are havng a happy hour fondue party with friends tomorrow and I can’t wait to make your cheeseballs. I just bought some cranberry mustard from American Spoon that you NEED like right now!!! It’s amazing with the cheese platter and app situation you have here. Thanks for inspiring as always! $ 89 per hour Seriously, I do not know why more people have not tried it, I work two shifts, 2 hours in the day and 2 in the evening … and I receive ann unsatisfactory check for $ 12520 which is genial is Im Works from home if I get more time with my children. $ 89 per hour Seriously, I do not know why more people have not tried it, I work two shifts, 2 hours in the day and 2 in the evening … and I receive an unsatisfactory check for $ 12520 which is genial is Im Works from home if I get more time with my children. I made this for our Christmas Party this weekend and everyone loooooved it. And now I have leftover butternut squash and sage!!! So many wins!